I realize that I’m still only in the mood to recap happy scenes in Bu Bu Jing Xin, even if the unforgettable moments remain the ones that wring my tears dry. I’ll likely attempt recapping some of those scenes when I’m emotionally stronger. I’ve come to realize that Ruo Xi fell in love with 8th Prince rather without any logic to it, but their breaking up was because she was too logical about it. Whereas Ruo Xi falling for 4th Prince was all about weighing how he treated her in the palace and knowing his fate as the victor, but once she fell in love with him, all logic went out the window and she was a goner for that relationship. It goes to show that love, of the soul-searing variety, really cannot be validated or explained. It simply is. 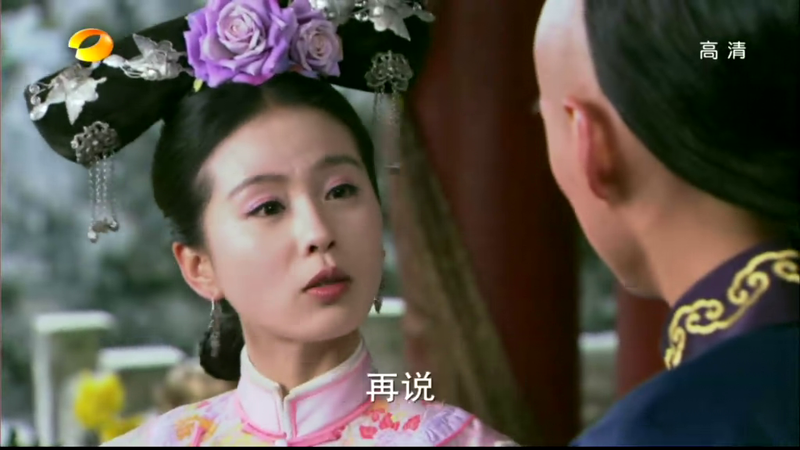 Ruo Xi has just had a conversation with 14th Prince that leaves her shaken. 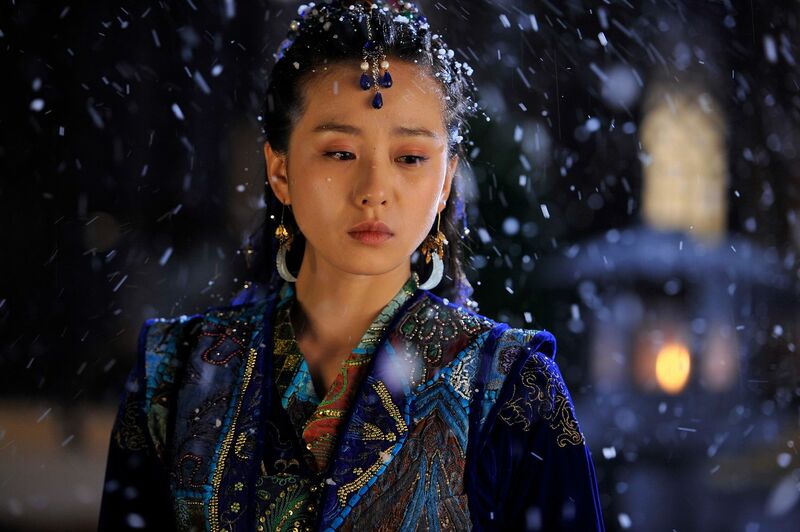 She runs into 4th Prince and 13th Prince, who notice that she is rather overcome. 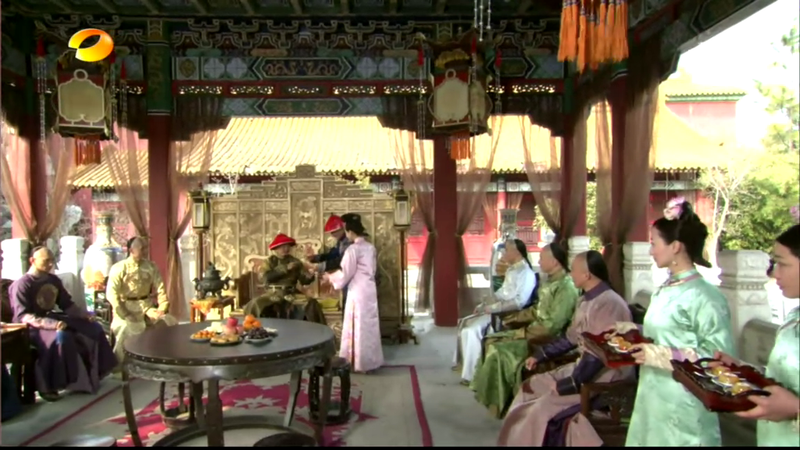 13th Prince wisely walks off to the side as 4th Prince asks Ruo Xi what happened. 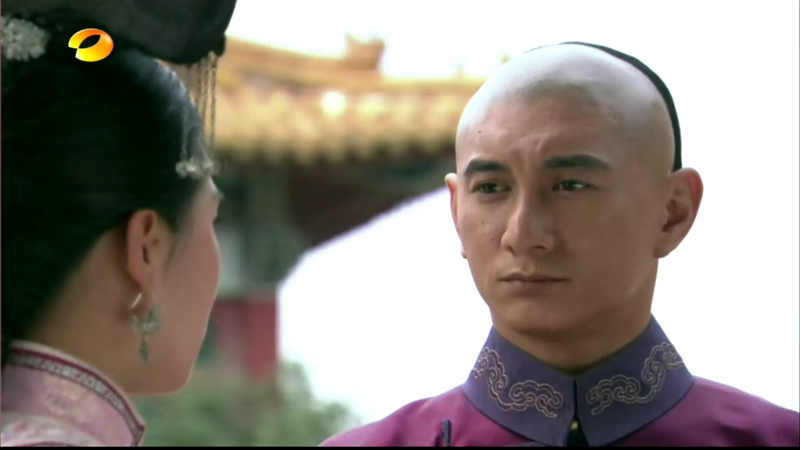 Ruo Xi looks at him, and asks him if what he promised to her is still true going forward. He will always tell her the truth, right? 4th Prince says yes without hesitation. Ruo Xi tells him she’s fine now. She doesn’t want to tell him what exactly upset her, can he accept that? 4th Prince nods and says yes, he can accept that. 4th Prince walks away as he’s headed to meet the Emperor. Ruo Xi looks at his departing back and thinks to herself that in the Forbidden City, there is someone who can ease her fear and wariness. Someone who listens to her worries and gives her candid advice, who discusses things with her. She doesn’t know what the future will hold, but for now, this is a good beginning. A little while later, the Emperor sits in a pavilion with some of the princes and asks when was the last time Ruo Xi prepared a special dessert for him? It’s been awhile, so he’s excited about sampling this new confection. 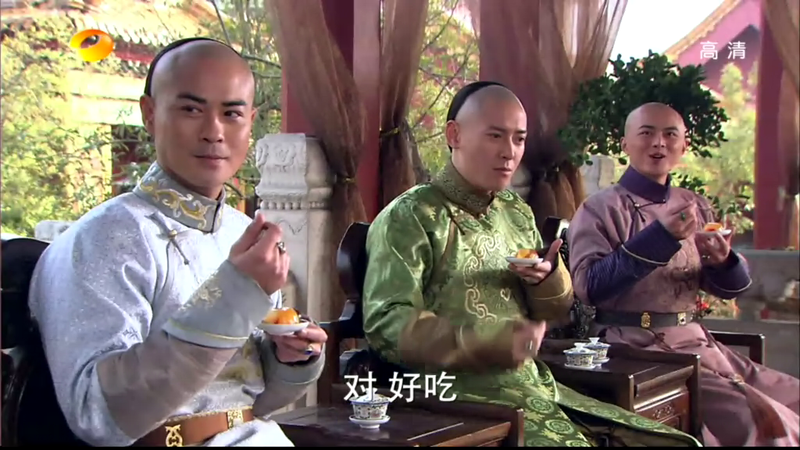 Ruo Xi serves the Emperor the new dessert, which looks frankly like a fancy jello. Memo to self: must learn better culinary skills in case I time travel back and need to entertain the Emperor. The Emperor takes a bite and compliments it as delicious. He tells the servants to serve the dessert to the princes. Each of the princes gets a dessert, and Ruo Xi personally serves 4th Prince, with a twinkle in her eye. The princes all take a bite. The Emperor asks 8th Prince what he thinks of it, and 8th Prince says he has the same opinion as the Emperor. 8th Prince is not a brown noser, he simply is agreeing with his father in a very genteel way. The Emperor then asks 4th Prince what he thinks. 4th Prince is quiet, and finally answers that the dessert was so delicious he was lost in thought enjoying it. Ruo Xi holds back her smirk. 4th Prince gulps down his cup of tea and asks for more. 13th Prince notices his brother’s strange and seemingly insatiable thirst. 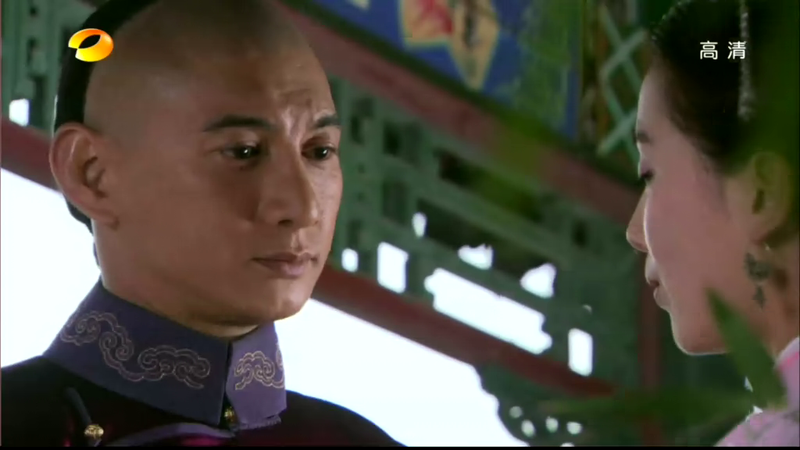 Afterwards, 13th Prince waits for Ruo Xi, who prances over asking where 4th Prince went. 13th Prince replies that 4th Prince supposedly went to change. 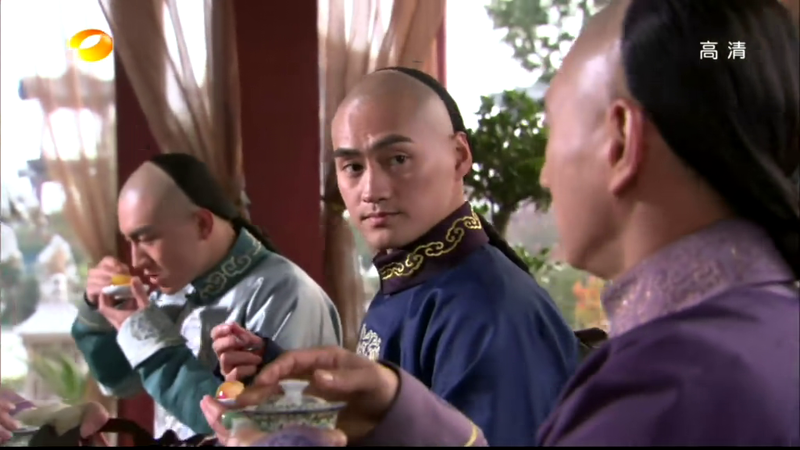 Ruo Xi then doubles over in laughter, which causes 13th Prince to query what is so funny. Ruo Xi says she put something extra in 4th Prince’s dessert that was not in anyone else’s. 13th Prince is a tad worried and asks what it was? Ruo Xi confesses that it was salt. 13th Prince laughs to find out the real reason 4th Prince was inexplicably thirsty eating the dessert. He is amazed at how ballsy Ruo Xi has become, daring to prank humorless and poker-faced 4th Prince, and in front of the Emperor, no less! Ruo Xi says it had to be in front of the Emperor, otherwise she wouldn’t get away with it. She says it’s payback for all the times 4th Prince has teased her. Suddenly 4th Prince returns and Ruo Xi tries to make a quick getaway. 13th Prince grabs her arm, telling her that if she dared to play the prank, she must have the courage to face 4th Prince. 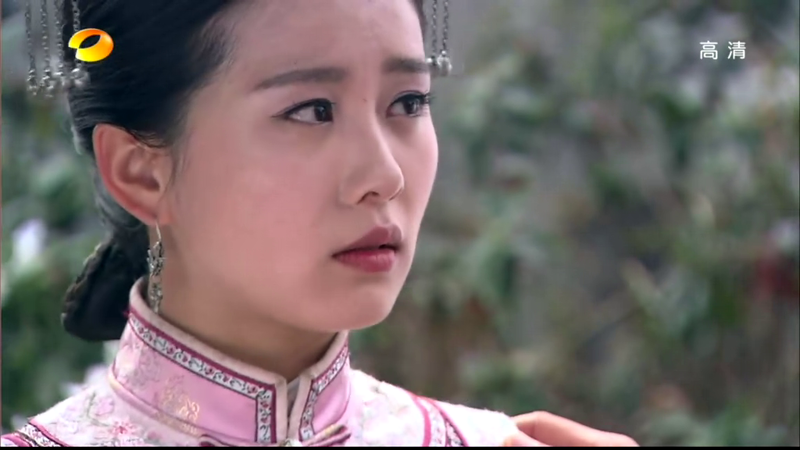 Ruo Xi whispers that 4th Prince is probably at the peak of his anger, to which 13th Prince realizes she’s right so he lets go of her arm. 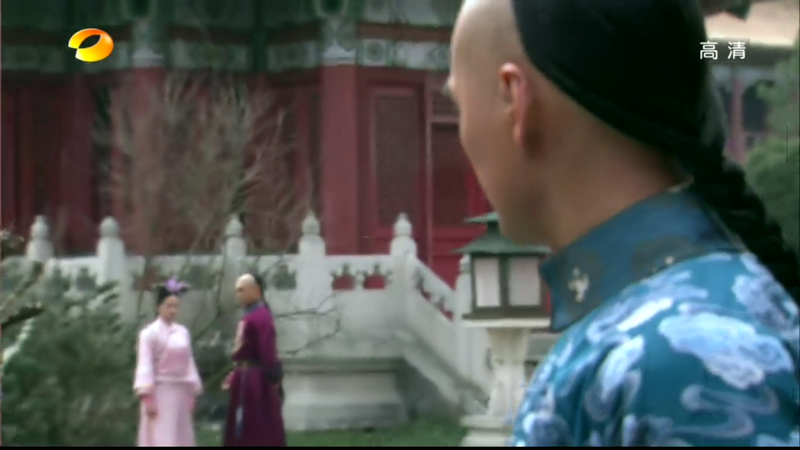 Before Ruo Xi can escape, 4th Prince tells her to halt it right there. 13th Prince gives her a “you’re so screwed” look and a smirk before quickly making himself scarce. 4th Prince walks up to Ruo Xi but doesn’t say anything. She tells him to make it quick, i.e. his punishment for her. He tells her to stick her hand out, and she does so reluctantly. To which he grabs her hand and whisks her away to the corridor and flicks her on the forehead. He asks why she’s not afraid of him anymore? Ruo Xi tries to say she was just a little bit afraid of him. Or maybe just a little bit more than a little bit afraid of him. 4th Prince turns to walk away. Ruo Xi adorably grabs his arm and asks him if he’s leaving? She worriedly asks him if he’s really truly angry with her, is that why he won’t talk with her? 4th Prince stops and looks at her, before grumbling that he’s really thirsty. Ruo Xi watches him leave and starts to laugh out loud. Later that night, as Ruo Xi is sitting at her dressing table, she starts to crack up. 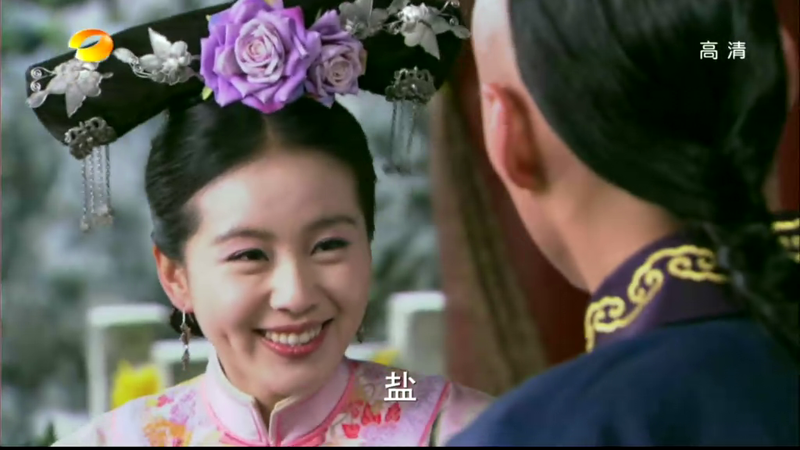 Yu Tan walks by and points out that she hasn’t seen Ruo Xi laugh like this in a long time. 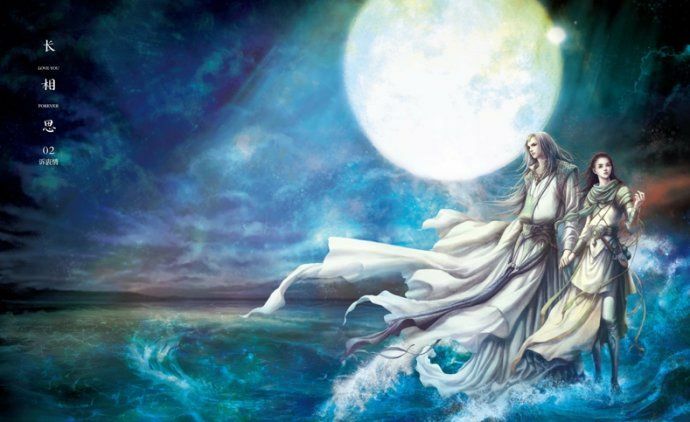 Ruo Xi grabs the mirror and looks at how her eyes are still twinkling with mirth. She wonders to herself when the last time she genuinely enjoyed life like she did today? The way I see it, the only time she’s herself after she entered the palace is with 13th Prince and 4th Prince. The former as a confidante, the latter as her safety net. But before she knows it, the safety net has become something more than she ever imagined. He has become her source of joy. The jello sounded a lot more delicious in the book. Heh. I was wondering when u will recap more scences from bu bu jing xin, and u recapped once again! Yeah…thanks! waiting for your next recap about BBJX..
Yay! Another recap of those happy times. Thanks Ms. Koala for introducing this awesome drama, my first ever mainland C-drama. Call me a coward, I rewatched those lovely 4th-RX scenes countless times but never dare venture pass ep28. Me like to remember only these happy moments, thank you very much. RX certainly caught 4th’s attention during her suicide attempt but it’s hard to tell when he actually falls for her. From the show, you can see the transition of 4th Prince from ‘interest’ to ‘love’ after he sees an imaginary Ruoxi dancing for him. His subsequent interactions with Ruoxi are all longer, with more depth, as a result. Although it is not in the novel, the imaginary dance sequence was brilliant. 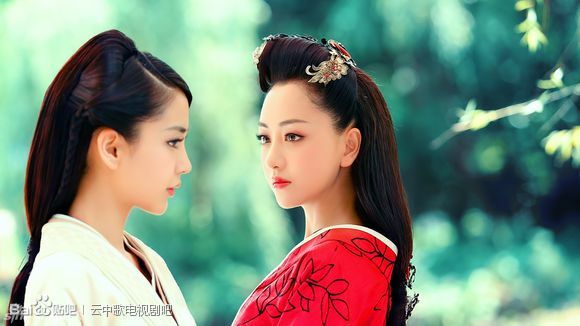 In the novel, 13th told Ruoxi at their mid-autumn rendevous in the imperial garden, that he can feel that 4th’s liking towards her is different after the said Manchuria trip – his usually decisive brother actually deliberated for a few days before getting Ruoxi to reaccept his hairpin and necklace. Although it is very clear thus when is THE moment for 4th, I think it is rather boring, hence the appreciation of an imaginary dance sequence. To think I thought the dance is very cheesy when I first saw it! It is only after I research the book on the same question and appreciated the significance. Thanks Koala. I have been rewatching the show as a slow way of letting go. Your recaps are really a balm for my affected heart. Oh Moonblossom, you speak my heart’s words. Koala’s recap are really a balm for the affected heart. I had recently finished New HZGG which tore me up in different (not so great) ways…and before that I had just finished Hunger Games Trilogy (brilliant books)…and I started watching BBJX out of curiosity. I was instantly hooked and rocketed through the entire series…now I need nurse my shattered heart and seeking and consuming all that I can about this world. Koala’s deliberations have most certainly helped. I thought the dance was cheesy too. Now, I understand the significance… ahh…this drama sure has a lot of hidden meanings to things. gah! 4xRX scene for this is SO CUTE!!!!! Love 13 for being so supportive of them. Omg hahaha.. Yes! Finally another post on BBJX. I enjoy reading your posts about it! I also LOVED the pudding salt scene. I also LOVED the episode before where they promised to be honest with each other. 4th tells her to do something meaningful and she replies with: such as? And he answers: thinking what songs she should sing on his birthdays<3. Gah. I'm still BBJX-ing and I still cannot get over it. wat ep is this from anyways? It’s ep 19 in the DVD version, ep 21 in the live-airing version. The DVD version was 35 eps, live-airing was 40 eps because of all the commercials. i just watch this episode yesterday. my worst withdrawal ever. seems like i can’t let go. totally a 4th/rouxi shipper now and i guess this is going like long/shi now. sorry hong/shi shippers. it’s just that the only thing that could cure me would be seeing nicky and cecilia together even after bbjx. also, i hope that you would continue to post the 2nd part of the behind the story segment. thanks again!!! This scene made me see 4 in a different view – A thirsty grown man. Haha I kiddz. But I really love this scene. It’s hilarious and it was a good treat for us to hold onto while the scary dramatic scenes come. I really love how 4 always manages to stop Ruoxi in her trails. Ah love that tiny bit of awkwardness. 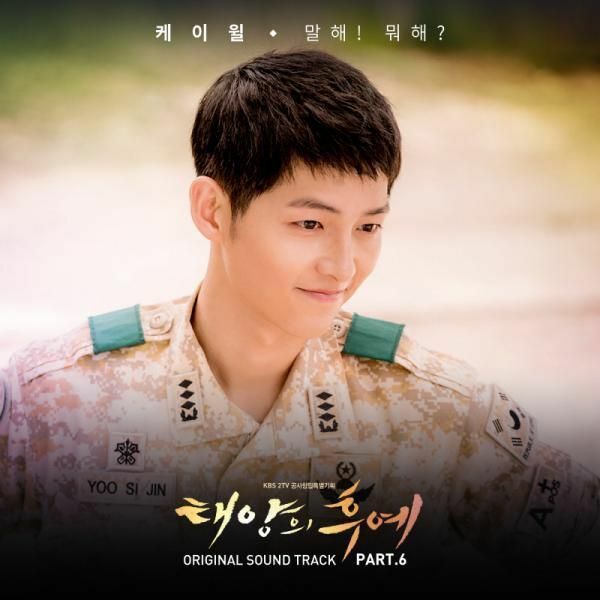 I don’t know about anyone, but it’s this remembering of RX and 4th’s happier times that makes it even more painful for me to watch the terrible things that followed after.. That they could have so many tender and precious moments in the beginning yet suffer a tragic ending… Aigoo obviously I’m still not over BBJX! Loveyour recaps. I’m one of those rewatching the happy moments again and again. Just wondering whether during Qing dynasty steel spoons existed cause the princes are using steel spoons to eat their dessert???? Thanks for the scene recaps! 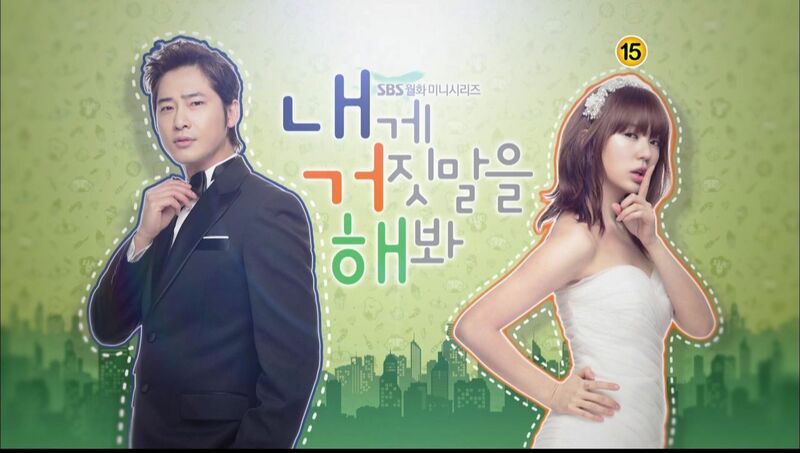 I’ve finally caved and started watching the drama! What episode is the above scene from? I really want to watch it now! HaHa. Thanks! Yay! I’m happy to know I’m not the only one thinking I need to learn some jelly-making/culinary skills just in case I might time travel back into the past. The favor could just possibly save my life. ‘gengyi’ means changing clothes, but it also is a nicer way of saying ‘going to the toilet’. In this situation, it’s the more appropriate meaning, and explains why Ruoxi was laughing. I am up to episode 16 and loving it!!! My take on Rx and 8th – He is an attractive man and easy to be attracted to – also he was early on interested in Rx and had paid her attention and was already slowly easing his way into her affections. Rx not unnaturally would be attracted to such a charismatic man. And that attraction also led Rx to try and make 8 love her enough to want to give up the throne. Hence the full blown romance in the grasslands. 4th!! while 8th makes me go all warm and smiley – 4th on the other hand makes me go all nervous and tingly and anticipatory. I do believe Rx loved 8th but right from the get go 4th had already made an impression on Rx. Even as Rx is romancing 8th – she gets flashbacks of 4th!!! I think they both are so suited to each other in that they understand and appreciate each other in their individuality and honesty and this binds them irrevocably. I squeal every time Rx and 4th are together!! does anyone know the melody played in this episode when the 4th prince grabbed ruoxi’s hand and whisked her away the corridor? I’m getting crazier about Chinese drama because of this. It just started as curiosity as I nonchalantly open your updates about Ballad of the Desert, then proceeded to check your book recaps and I’m hook, crazily hook. I’m on ep 10 now of bubuxing , and really enjoying it. Keep coming back here for review and giggles. Thank you Ockoala dear! HAHAHAHAHA great article!!!! Exactly how I liked and felt about the scenes!